We tested seven baking dishes to determine which ones were best for baking and roasting, and were easy to clean and maintain. The standard nine- by 13-inch baking pan is essential for every kitchen. This is the perfect vessel for bubbling casseroles, cheesy lasagnas, even for roasting meat and vegetables. Unlike many roasting dishes or sheet trays, a deep baking dish can go directly from the oven to the dining table, then to the refrigerator with whatever leftovers remain, without skipping a beat. The challenge is in deciding which one to buy: Not only are baking dishes available in a range of materials, from glass to enameled stoneware, they also vary widely in price, from as little as $10 to upwards of $300. We tested the top seven brands to find the dishes that baked and broiled the best. The Best Porcelain Baking Dish: Harold Import Co. This baking dish from Harold Import Co. is both lightweight and durable, at a price that’s hard to argue with. The large looped handles are easy to grip with either oversize oven mitts or kitchen towels, making it a snap to lift from a hot oven. It's broiler-safe up to 500°F (260°C) for golden, crunchy toppings on casseroles and gratins. It can be easy to brush off appearances as unimportant, but tableside presentation is a big part of a baking dish’s appeal. If you want excellent performance combined with a handsome and classic design that will look great on your holiday table (or on your Instagram account), Staub is your best bet. This heavyweight dish heats evenly in the oven at temperatures up to 575°F (300°C) and has great heat-retention powers, keeping food hotter longer when you're serving. The generous four-quart capacity is ideal for large roasts and extra-deep casseroles. This three-quart Anchor Hocking baking dish comes equipped with easy-to-grip handles for effortless transfer to and from the oven. The tall, straight sides are perfect for generously layered lasagnas and deep bread puddings. Its compact and lightweight design makes it ideal for small kitchens. Although it’s not broiler-safe, at only $20, it’s a great budget-friendly choice. We want a durable baking dish that heats and cooks food evenly, with large handles that make lifting and carrying it a breeze. Sufficient depth for a generous casserole or baked pasta and ease of cleaning (whether by hand or in a dishwasher) are both pluses. Easy-to-grip handles are particularly important when a dish is hot and filled to the brim. The last thing you want is to grab skimpy handles with thick oven mitts and have the whole thing come crashing to your kitchen floor. We gave preference to baking dishes with larger handles that could be easily held with a variety of implements, from a folded towel to a silicone mitt. We measured the dimensions and volume of each dish to see if it was true to size. We wanted baking dishes that ranged in volume from three to four quarts, so that they'd work well with most standard recipes, and prioritized dishes that offered some additional depth. That depth gives you a little more flexibility with whatever you’re cooking, such as a lasagna with extra layers. Dishes that are significantly larger or smaller than the standard size, though, can present problems, as they can dramatically alter the outcome of a recipe. We also rated each dish on how easy it was to clean. 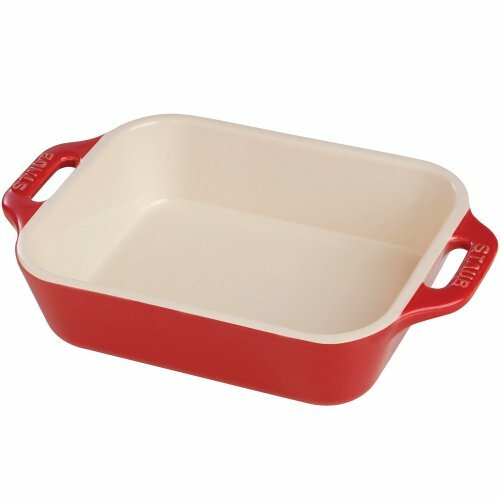 A good baking dish should allow for easy removal of tough baked-on food, without risk of scratching the dish’s finish. Manufacturers of glass bakeware warn of thermal shock due to rapid shifts in temperature, which can lead to dishes cracking, breaking, and even bursting. If you’ve never had time to look at all the fine print, it’s important to understand that there's more to it than the obvious freezer-to-oven scenario. Uneven heating is enough to shatter a dish, so manufacturers recommend that these dishes always be evenly filled with food or liquid. When an oven is preheating, the temperature can shift rapidly, so it's recommended that you always place a glass baking dish into an already-preheated oven. The manufacturers of glass baking dishes also recommend placing hot-from-the-oven dishes onto a folded towel or pot holder, rather than directly on a cold marble or tile surface. These dishes are also not broiler-safe and can be heated to a maximum of only 450°F (230°C). Given all these precautions, glass baking dishes may seem like more trouble than they're worth, but we haven’t had any issues with them when they're used as recommended. We feel that glass baking dishes are a reliable and inexpensive option when used properly. An ideal potato gratin will contain creamy and tender potato slices, topped with a crunchy, golden crust, and browned edges underneath and all around—a quality that requires good heat transfer from the dish to its contents. We baked a potato gratin in each baking dish at 350°F (180°C) for one and a half hours before examining the taste, texture, and color of each. Our tests here didn't reveal a huge difference from one baking dish to the next. Most of the dishes produced a silky gratin with an evenly brown crust and top; we found only subtle variations between them. There was one outlier that yielded a gratin with a soggy and wet bottom, and another that produced an overly darkened crust. But the differences between the others were insignificant. Flans and custards are finicky creatures, sensitive to any fluctuation or unevenness in heating that could quickly turn them into a curdled and clotted mess. To protect them from this, the cooking vessel is usually partially submerged in a hot-water bath, ensuring even heat that’s less prone to wide temperature swings. To test how evenly each baking dish heated, we baked a double batch of flan in each one at 275°F (135°C), without using a water bath. By removing this buffer, we were able to easily see which dishes heated more unevenly. Each flan was baked until the center reached an internal temperature of 180°F (82°C). Afterwards, we looked at each flan’s taste and texture in the center, along the edge, and in between. We also noted each custard’s internal temperature in various locations. None of the flans were perfect, because this isn't the ideal method for baking a custard, but they came pretty close. The majority of the dishes performed similarly, producing a creamy center and curdled edge. One baking dish yielded a flan that rapidly sped past the target internal temperature, producing an entirely curdled custard. We took notes on how well the handles on each dish were designed by repeatedly moving full, hot dishes into and out of the oven. The testers also carried the hot dishes up and down stairs. We awarded higher scores to dishes that were easier to carry. To test ease of washing, every dish was scrubbed clean of burnt-on cheese and sugar. All the dishes are dishwasher-safe, but we hand-washed each to better understand how well it cleaned up. More points were awarded to dishes that rinsed easily and were more maneuverable in a small sink. Heavy stoneware dishes with small handles were especially difficult to work with; the testers preferred lightweight porcelain and glass dishes. Luckily, with the exception of one poorly performing outlier, all the dishes we tested effectively did the job. Given that the majority of the baking dishes performed similarly well on our flan and potato gratin tests, we determined our winners based on a combination of price, appearance, and ease of use. The winners were all easy to clean and have comfortable, large, looped handles for better maneuvering. The Harold Import Co. baking dish has the largest handles of the dishes we tested, with roomy, wide loops that even the thickest oven mitt could grip. At just over two kilograms, it is as lightweight and compact as a glass baking dish, with the durability and high temperature resistance of stoneware. The standard dimensions and three-quart volume work with most recipes, and the tall, straight sides allow you to cut neat, even portions from the edge. If you want showstopping design, the classic look of this dish will work great on any table. It has just as much function as form, with large looped handles and straight sides. The Staub is safe to use in ovens up to 575°F (300°C), the highest temperature resistance of all the dishes we tested, making it a prime candidate for use in broiled recipes. This dish has two-and-a-half-inch-tall sides and a four-quart capacity, useful for preparing deeper dishes and larger quantities. 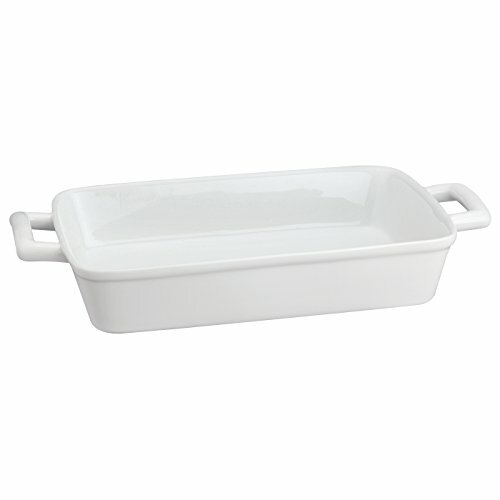 The Anchor Hocking baking dish is lightweight with a slim profile, ideal for the small kitchen of the beginner cook. When we used it according to the manufacturer’s specifications, we had no issues with breakage or cracking due to thermal shock. (We even stress-tested it by deliberately violating some of the guidelines, and we still failed to break the dish, but that doesn’t mean you should feel free to misuse it—it takes only one careless move to permanently crack the glass and send your dinner to the garbage and, possibly, you to the ER.) The large handles made this three-quart dish easy to hold. At two and a quarter inches tall, this dish was the tallest of the glass baking dishes we tested. The Le Creuset produced the wettest, most undercooked potato gratin, as well as the most curdled and overcooked flan. While we liked the accompanying lid, this dish was the heaviest; combined with its small handles, that made it a very unwieldy option. This Pyrex baking dish turned out an uneven flan and a somewhat scorched potato gratin. We also didn’t like the small handles, sloped sides, and slightly shorter height of this dish. The OXO dish comes with a plastic lid, which makes it convenient for transporting food to a potluck and storing leftovers. However, we preferred the larger handles of the Anchor Hocking dish. The gratins baked in the Emile Henry dish had good even browning, and the dish was easy to clean. Unfortunately, it was one of the largest dishes, at four and a half quarts in capacity, with some of the smallest handles, making it difficult to lift and carry when full.